Vortex Viper HD 10×42 Review: Worth your money? 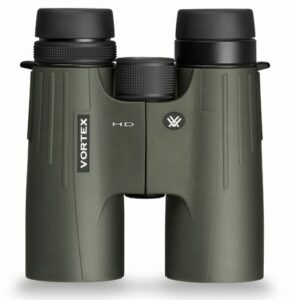 Today I’m taking a closer look at the Vortex Viper HD 10×42 binoculars. Just how great are these optics? What’s included with them? And how do they stack up against the competition? There are plenty of choices out there for quality binos, whether you’re into bird watching, wildlife viewing, hunting or even astronomy. Getting the results you’re after is all about selecting the right pair for your hobby. You can use the links below to navigate to your most pressing question about this product, or you can continue reading the review. Vortex Viper HD: 10×42 or 10×50? So in my Vortex Viper HD 10×42 review, I’ll also touch on what these binoculars are best for. That way, you’ll know if they’re a good fit for you. This is always an important question; besides the product itself, what do you get with the Viper 10×42 Viper HD binoculars? Well, these binoculars come boxed with an all-important rain guard, tethered objective lens covers, a comfortable neck strap and a deluxe carrying case. Also included with the purchase is a VIP unconditional lifetime warranty, which Vortex tends to do an excellent job of standing behind. If at any time something happens to your binoculars, they will be repaired or replaced by the company at no cost to the customer, with no questions asked. If you’re making the upgrade from a more budget-priced pair of optics to the Vortex Viper HD 10×42 binoculars, you’ll quickly notice the difference. Two of the features I most appreciated about the Vipers are how well they perform in a variety of adverse conditions and how crisp the view is through them. The XR lenses in these binoculars are fully multi-coated, and O-ring seals within prevent moisture, dust and debris from getting inside and ruining your view. Whether you’re spending the day sitting in a chilly bird hide, perched in a tree in a spring shower or caught on a dusty adventure, nothing will penetrate these binos. What’s more, argon gas purging within makes the Vipers fog proof and waterproof, so that sprinkle or rain or early morning fog won’t come between you and the focus of your attention. Because there’s full XR multi-coating on all air-to-glass surfaces of the Vortex Viper HD Binoculars 10×42, they have increased light transmission over other models. Dielectric prisms help to provide clear, crisp and colour-accurate images. The HD extra-low dispersion glass also helps deliver amazing resolution and true to life colour quality . It’s this clean view with accurate colour that I’ve appreciated in checking out Vortex Viper HD 10×42 for sale. If you’ve been looking at both the 10×42 and the 10×50 models and debating what to pick, my comparison of both pairs might help you make your choice. For one, it’s worth noting that the 10x50s are in a slightly higher price range. On Amazon, they’ll cost you just over $600, whereas the 10×42 are usually just under $600. If you’re concerned about size and portability, while one isn’t significantly larger than the other, the 10×42 model is slightly more compact and easy to bring during your travels. On the other hand, the 10×50 binos offer a wider field of view and do a better job of gathering more light in low-light situations. For these reasons, they may be better suited to hunters, offering earlier opportunities to see targets. In contrast with one of Nikon’s current offerings, you’ll likely find that the Vortex Vipers are slightly less expensive, especially if you’re purchasing online. Other than that, many of the key features are similar. Both pairs use dielectric prism coating and extra-low dispersion glass, and both benefit from roof prisms. They’re also similarly protected against the elements, featuring O-rings to keep out dust and moisture. However, while the Vortex Vipers use argon gas purging to stay fog and waterproof, the Monarch 7s rely on nitrogen. When it comes down to it, both are a fairly decent pair of binos, but it depends on what you want to use them for. 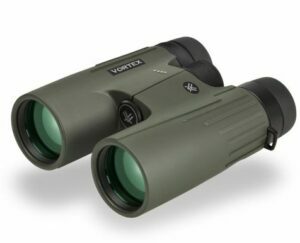 While the 10×42 Vortex Vipers might be best for hunting, the 8×42 Monarch 7s are likely better suited to birdwatchers. Going back on-brand, I also took a look at these binos against the Vortex Razors to see what the difference is. I can tell you, one of the main differences you’ll notice immediately is the price. While the Viper HD will likely run you just under $600, a pair of the Razor model will cost you more than 1000 dollars. So what do you get for the extra cost? Both have the standard features that you’d expect from Vortex; the quality O-ring seals, roof prisms and quality lenses. The Razors, however, are built on a sturdy magnesium chassis that while exceptionally light and durable, is actually 0.2 ounces heavier than the Vipers. In the Razors you’ll enjoy a wider 6.9 field of view, while the Vipers are limited to 6.1. The Razor model also has a greater minimum focus distance and wider range of interpupillary adjustment, making them better suited to some users. Choosing between these two models will likely come down to how much you want to spend. 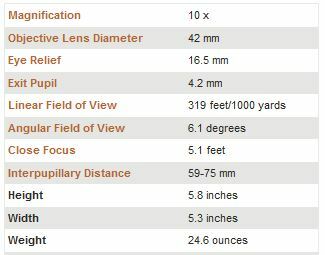 Both are excellent for hunters or anyone who prefers a wide field of view, and feature the same quality construction. Where to buy at the best price? If after reading this Vortex Viper HD binoculars review you’re thinking of investing in a pair, you’ll be able to find them quite easily. They’re widely sold in shops worldwide as well as online. One of the most reliable places to pick up a pair is Amazon. They usually have some of the most affordable pricing, shipping is often free and they have a good returns policy if for any reason you’re unhappy or change your mind. It’s worth noting you can also shop for Vortex binoculars on Ebay, but I will say that I haven’t received original binoculars from any sellers as yet. Beware of imitations and knock-offs! If you do choose Ebay, just make sure you read the fine print before you bid or buy. Ensure you’re getting the latest model that you’re expecting to, and find out whether what you’re buying is a factory refurbished or slightly damaged product. You should also check out the seller’s shipping options, with insurance, and their returns policy. I haven’t heard many complaints about these binoculars. They’re widely praised for their quality and value for money. However, the eyecup cover can be hard to use initially, tight and sticky during moments when time is of the essence. Users with glasses have expressed a desire for more eye relief. And few people have also remarked that these binos aren’t as light as they were expecting, with similarly priced pairs being easier to hold. Whether those pairs offer the same crisp imagery is another story. Minor complaints aside, overall these optics are great quality. Hunters and wildlife viewers can take a step up from a budget model to something superior without having to spend thousands of dollars. It’s easy to appreciate the crisp vision you’ll have with these binos, including their natural colouring and light transmission. Vortex’s excellent warranty and customer service are also great to keep in mind, as you know should something happen you won’t have any hassle. When it comes down to it, the Vortex Viper HD 10×42 is a an exception pair of binoculars that offers great value for money.